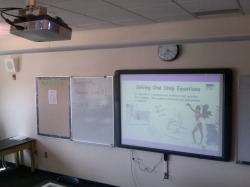 Interactive whiteboards and mounted projectors have been installed in nearly every full size classroom in the district. Most of these teachers have also received a laptop computer to use with them. This gives teachers the opportunity to work anywhere in the district as well as at home. Please see our links for more info. for staff to use for lesson plans, research and professional development. With so much information available in electronic format these days, our Library Media Centers get quite the workout! Computers are located in every library in the district.